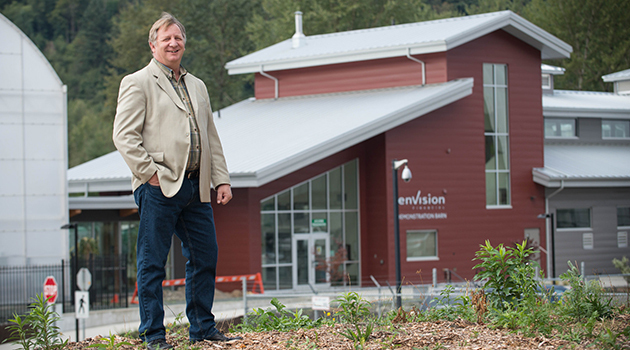 Garry Fehr stands outside UFV’s Agriculture Centre of Excellence. The University of the Fraser Valley (UFV) welcomes the government of British Columba’s recent announcement of the #BCTECH Strategy and the strategy’s greater emphasis on post-secondary learning in technology sectors. One such sector is Agri-tech, where technology is used to improve yield, efficiency, and profitability of food production. As the global population marches towards 9 billion in 2050 and as arable land area shrinks, Agri-tech is emerging as a vital way of maintaining sustainable food production and thwarting food shortages. In all cases, students are engaged in research and develop knowledge and work-place skills through hands-on learning while contributing to the growth of the Agri-tech sector.